Soak up some fun with sponge painting techniques. Paint indoors or out and dab away those "I'm bored!" blues with quick and easy sponge painting ideas kids will love. Grab your child's favorite cookie cutters or check online auction sites for cookie cutters in various shapes at a low price. Place each cookie cutter on top of a kitchen sponge. Use a marker to trace around the outside edges of the cookie cutter. You now have a pattern on your sponge. Use scissors to cut around the marker lines and make fun sponge shapes. If you don't want to cut your own sponge shapes, look in the bath aisle at your favorite toy store for a pre-cut set. Costs are typically between $5 and $10 for a bag of 10 or more. Fill a bucket with water. Put the sponge shapes in the water but don't oversaturate them. If you do, the water will just pour out of the sponge when it's pressed and the shape won't show up. If the sponge does get oversaturated, squeeze some of the water out. With water, kids can paint anywhere outdoors. They can use their wet sponges to make shapes on the driveway, the fence or even the car. Pour non-toxic paint into disposable plates or bowls. You want to use just enough paint to lightly soak the bottom of the sponge when it's placed in the paint. If you use too much paint, the sponge will become too wet to form a solid shape. Once the paint is poured, kids can use their sponge shapes as a paintbrush. Use a variety of materials to show them how different the shapes look on each material. For example, make a wall canvas out of banner paper, use a paper plate, a piece of wood or let them sponge paint on regular paper. Be creative in your search for materials and you'll be surprised at how different the technique looks on various surfaces. 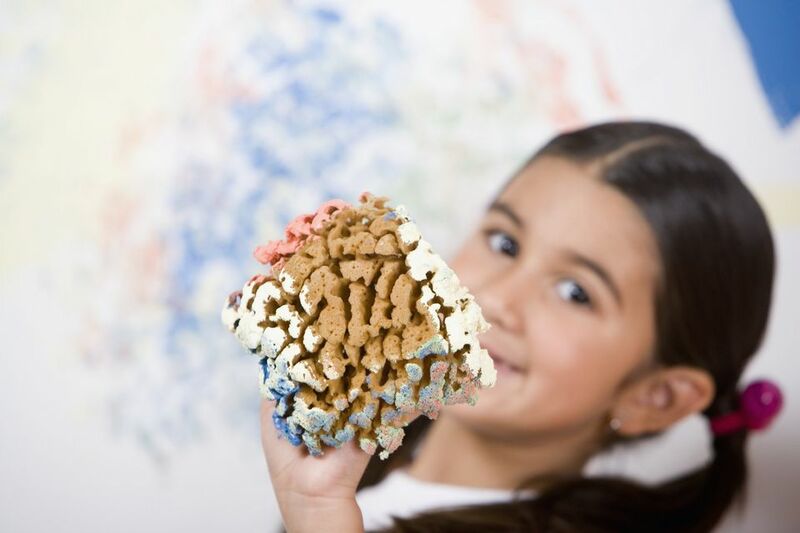 Once your kids are finished sponge painting, be sure to thoroughly clean the paint out of the sponges. That way, your sponges won't be crusty and hard with leftover paint. They'll be ready to go the next time your children want to paint, which will probably be tomorrow! Allow your children's artwork to dry completely before prepping them for hanging. You don't want to upset the artists if you smudge that beautiful art because the paintings were still wet. The shapes make beautiful artwork you can display around the house to show off their masterpieces. Use a hole punch to make holes you can string rope or colorful yarn through to create a hanging loop. Or you can attach magnets to the back of the artwork. Help your child sponge paint inexpensive frames and then frame her works of art. Encourage them to make their own picture frames from scratch to perfectly match their art. There's no limit on how they can finish off their paintings. Now let your children decide where to display some of those masterpieces. Your room, their rooms, the toy room, dad's office, the car. Your children's art gallery can extend past the refrigerator door. They get to show off their artwork and gain a sense of pride at the same time.